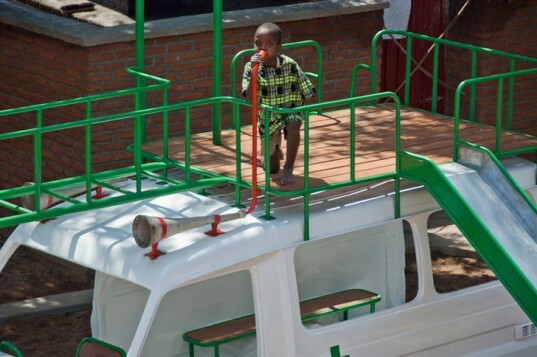 Dutch designers Luc van Hoeckel and Pim van Baarsen have transformed a parking space for a children's hospital in Malawi into a playground. In association with Sakaramenta, a social business that provides push and bicycle carts and play equipment, the team created their structures from recycled materials. A scrapped ambulance stands as a unique clubhouse for the recovering patients, acting as a creative centerpiece for both children and adults to enjoy. Very few people can say that they have ever had so much fun in an ambulance! Outside the Beit Cure hospital in Blantyre, Malawi a pair of Dutch designers have repurposed tires, axles, springs, and an entire ambulance to serve as a place to play and convalesce. 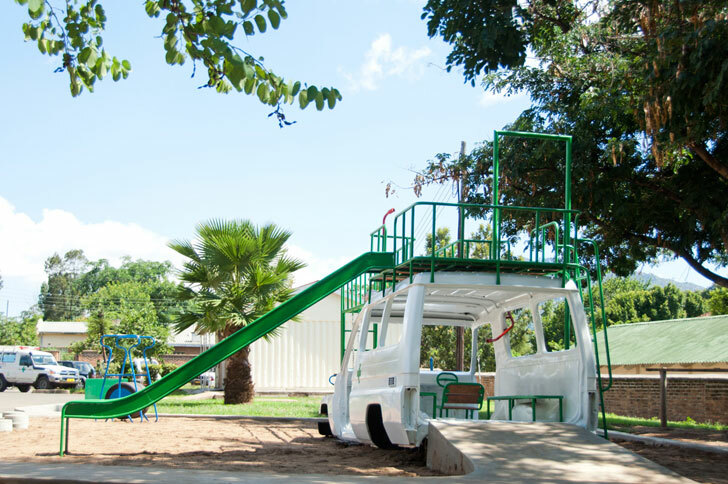 Specializing in orthopedic care, the hospital’s playground is an area where patients may not only recover in a relaxing environment, but also come into contact with other children from the neighborhood. Completely handicap accessible, the car park-turned-hangout is an excellent way to reduce the stigma of the disabled who can be seen as “different” — while at the same time finding a creative use for landfill materials. Outside the Beit Cure hospital in Blantyre, Malawi a pair of Dutch designers have repurposed tires, axles, springs, and an entire ambulance to serve as a place to play and convalesce. The ambulance was sourced from a scrapyard. The former parking area was cleared and transformed into a playground. A child enjoying the "tire run". Two kids having a go on the "Wheely". Completely handicapped accessible, the car park-turned-hangout is an excellent way to reduce the stigma of the disabled who can be seen as "different" -- while at the same time finding a creative use for landfill materials. A hospital's patient at the opening ceremony for the playground.